Reconfiguration of CLT terminal into ATL-style layout? Has there ever been any consideration to reconfiguring the CLT terminal into an ATL-style layout, with a head terminal and satellite concourses connected via an underground tunnel and people mover? With CLT growing so rapidly and only going to continue to grow, it seems the current layout will become increasingly inefficient in the years to come. Re: Reconfiguration of CLT terminal into ATL-style layout? Runway layout will mimic ATL. Impossible to copy ATL terminal layout. Has anyone looked at the master plan? A lot of questions about future growth projections, facilities needs, and planning options are considered in there. I'm not saying that to be snarky, but I'm curious since they likely have considered multiple scenarios in there and I'm actually interested; opposed to the usual a.net speculation and pipe-dream ideas. I don’t recall where but I have seen renderings of exactly this. Runway 5/23 is stated for closure and eventually there will be multiple concourses running E-W with the 4 parallel runways going N-S. Probably 20 years down the road? Intriguing idea but the sunk costs of the current upgrades make it unlikely until 2030 at best. Even IAH couldn't justify the expense of reconfiguring the 'groovy Jetsons' layout into a DEN/ATL configuration. As of now, at this very moment, the master plan calls for a satellite terminal beyond what will be the extensions of B/C. It appears it’ll be an RJ terminal (ergo DTW style). They are gunna knock down current E and put some more widebody gates into the “armpit” of D and E, plus widebody hard stand parking. That’s what the current iteration of the master plan shows right now. Indeed, I've seen a rendering posted somewhere on this website of a concourse parallel to concourses A and D. I believe it's imagined as a "regional" concourse. Master Plan from page 297 onward has terminal renderings. Given the age of B and C (and long walk times in between with narrow passageways and no moving walkways), I've always thought the below would be a good solution. Tear down B and C and connect their planned extensions to become a midfield concourse. Turn the terminal and the south side of A/D into widebody intl gates. Throw in a north field east/west connector taxiway to alleviate the bottlenecks around the terminals. A prior comment with a link to a PDF has more or less what you suggested as a possibility. However in the old terminal that is now used for office space, the construction company in charge of renovations have what I posted hanging on their wall. That was Alternative C-2 under the terminal alternatives in the above pdf. They gave the following reason as to why it was eliminated. Alternative C-2 was eliminated due to the limited aircraft parking depth between the new satellite concourse and the main terminal, created by bridging the Concourse B and C extensions. 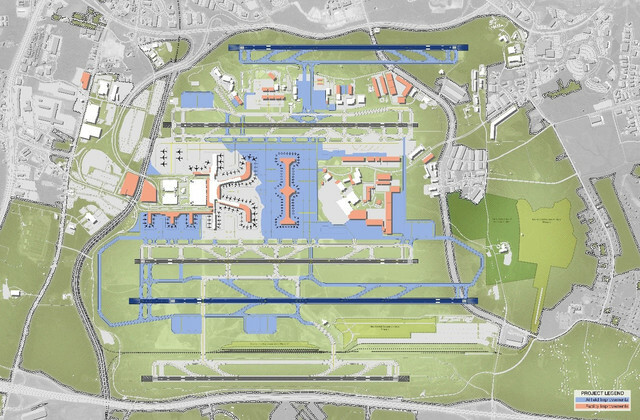 Due to these limitations, there was effectively no gain in total aircraft parking positions as a result of the removal of the Concourse B and C connections. What doesn't make sense about this explanation is the satellite in the preferred alternative is spaced further apart than the (second) satellite in C-2, due to the apron space stretching further down. In this case, why not just take the proposed alternative and bridge the B and C extensions instead of keeping the above ground connections? It would make much more sense IMO.